Not that we have really been gone anywhere. All of our holiday stuff is over, and everyone is well again--we almost. We are still trying to find Jonathan's room under all his Christmas stuff, but we haven't lost him in the mess yet. I just wanted to share a little picture of him with everyone. 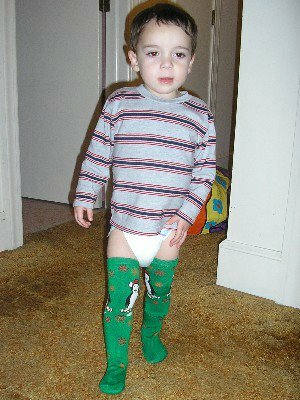 He found the socks that were our Christmas stockings, and he wanted to put them on. He wouldn't even take them off at bed time. The second photo is of him and his tongue thing. 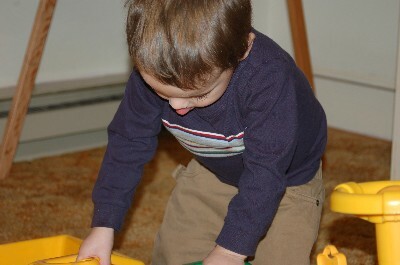 He was playing with his little riding tractor and trailer hooking the trailer up. He couldn't do anything without that tongue. AAAaaannnd, if you notice that the second photo is much better quality than the first, that's because I now have a camera that will let me take pictures indoors!! I'm so happy and excited. Everyone may be getting lots more photos of Jonathan at other times besides Christmas! Well, this week it's back in the groove, PCC, stuff at church, and Bible study. We'll be keeping busy once again! Have a good week!